WE WILL BEAT ANY NEW EQUIPMENT INSTALL OR CHANGE-OUT WRITTEN ESTIMATE. GUARANTEED! We understand that an unexpected HVAC breakdown can create havoc in a business. That’s why we respond quickly and with fully stocked service vehicles when you call; that’s also why we offer 24/7 coverage for emergency repairs. 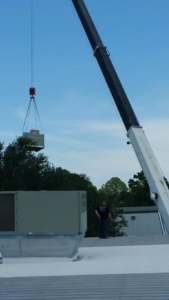 Heating and cooling systems play a decisive role in the success of most businesses. An efficient HVAC system not only provides a comfortable, productive work environment, but it also ensures a healthy indoor environment that’s favorable to attracting customers. When you consider that 40 percent of a company’s expenses relate to HVAC, careful attention to your HVAC system is essential. So call us today and let us impress you. Thank you for considering our services. Please let us know how we can help.